Okay, are we so sure the Loons are not bad? Were we all too quick to decide, as I wrote after the opener, that Minnesota are on track to exceed expectations? Depends on your definition of expectations. On Twitter following United’s unacceptable capitulation against the New England Revolution, I had a back and forth with 55.1’s very own Bill Stenross. Bill’s point was that given that everything we know about the club, this is a playoff bubble team, and results like Saturday’s are the kind of results that playoff bubble teams occasionally get. I think Bill’s point was completely right. But while he makes a good case that given a holistic view, a neutral observer would peg this team as a fringe contender, I beg to separate out its component parts and evaluate them independently. I look at this roster, and I see a team that is no worse on paper than, say, the 2018 MLS Cup runners up Portland Timbers. This is a team that, on paper, should be capable of earning a home game in the postseason. Let’s speak honestly about this. The reason that no prominent league-wide analyst believes they will achieve that is because the team’s coaching is widely viewed to be not adequate. My opinion on the team’s chance of success in any given week, then, is mostly determined by my faith, or lack of faith, in Head Coach Adrian Heath and his staff. In the Loons’ opening two matches, I saw enough to be intrigued and hopeful. In the last two, I’ve seen bad habits reemerge. I had hoped that this team’s improved roster might play into the strengths of a coach who had the most success when he was handling an Orlando USL team that was clearly among the league’s best rosters. Now I’m hoping that the qualities of the individual players on this team might shine through despite repeated mismanagement. Minnesota still have six points in four games on the road, which is better than they achieved last year, and still above the typical playoff pace. They will play a surprisingly winnable match this coming weekend, then open up Allianz Field with a full home slate still ahead of them. It’s not the time to #PANIC. But yikes, no team should be losing to New England this year, especially in the listless fashion that United managed. Maybe it’s time to hold less firmly to the idea that this team could over-achieve, that this team could be more than the sum of its parts. This isn’t the team that Minnesota fans deserve, but perhaps it is the team we should’ve always expected. 5. Ángelo Rodríguez is too slow. 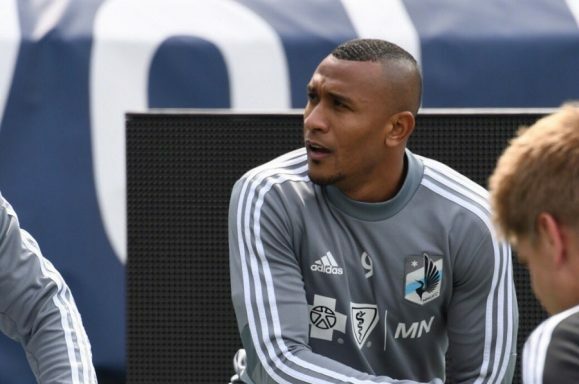 The Colombian has always been set up for failure with the Loons, after being tabbed as the replacement for the irreplaceable Christian Ramirez. It hasn’t helped that Rodriguez was never given any time he may have needed to settle into the league or find his feet in a new country, but instead was simply thrown into games as soon as he arrived. The spotlight of the designated player tag has never endeared him in the eyes of the public either. From the start of his Minnesota career, he has been held to expectations that may not have been entirely reasonable. But while these expectations cannot be helped, his own play certainly can be judged on its own merits. At some point, United are going to have to reckon with the fact that has Rodriguez not excelled, and in fact he has been rather poor. He played in a little over a quarter of Minnesota’s minutes last season, while the team scored just under a fifth of their goals. While he was on the pitch last season, the team had a goal differential of -12. When he was off of the pitch last season, across that other nearly three quarters of the time, they had a differential of -10. There are a lot of data quality issues with those numbers that make it difficult to assemble an ironclad case against Rodriguez. But we certainly have no evidence that suggests his impact has been positive. On Saturday, his strengths and limitations were especially stark. Certainly, the big man played the role of hold-up man with some notable success. The Loons played the ball repeatedly to his feet, and he held the ball so well against the New England defense, it reminded me of this famous Vigeland statue (don’t open at work). But as this sequence repeated itself, it began to feel as though Rodriguez was holding the ball up too well. In fact, he was delaying over the ball so much, and expending so much effort to keep away the Revolution defenders, that whatever momentum the attack seemed to have frequently died down while the Minnesota striker dithered. Furthermore, with the exception of his strongman act, Rodriguez was nearly useless in any other facet of the game. A lightning counter by the Loons in the opening five minutes died when the ball ended up on his foot and he looked baffled by what to do with it. A fantastic two-on-two opportunity, where all that was needed was a pass to Darwin Quintero in space, was blundered away as Rodriguez opted to take the ball in himself, and was easily contained. He ended the game with just a single touch in the box, which was a turnover, and no shots at all. That’s not acceptable from your starting striker, whether or not he is a DP or replaced a club legend. It’s obvious to everyone that Rodriguez is slow of foot. But the greater issue is that he’s also not quick-thinking. I don’t know how fast he does his multiplication tables or whether he is well read on international affairs—I don’t mean to call him dumb. But on the pitch, with players who want to play fast, like Quintero and Miguel Ibarra, Rodriguez’s ponderous movement and decision making stands out. It’s predictable and it suffocates his own team. Abu Danladi or Romario Ibarra should be starting at striker next week. 4. Vito Mannone had an awful game. I’ve been really high on Vito, but in Foxborough, the Italian had a shocker. The first Revolution goal, which was extremely savable, was strike one. I’m not sure what happened, whether he slightly misjudged the ball’s bounce off the turf or just overreacted to a surprisingly soft header, like a batter expecting fastball and whiffing at a change up. But that’s a save that a goalkeeper in this league needs to make. The Loons can’t keep allowing early goals this year (ask the Wild how that turns out), and so far, the openers in Vancouver and New England have put the spotlight on Mannone. Strike two was his distribution, which was truly terrible. Just three of his kicks beyond the halfway line were completed. The Loons needed to retain possession, and as the game went on, he played it short way more often, which was the right move, and Mannone’s passing accuracy with long and short passes improved when he did so, as he got more options. Minnesota clearly had an early strategy to get the ball into Rodriguez up top as often as possible. But for all of the striker’s dominance on the ground, he was completely dominated in the air, and Mannone’s stats were the casualty. You’ve gotta recognize that earlier. I’m still giving Vito the start in New York, but he needs to do better, or else he will justly lose his spot. 3. The fullbacks could not get involved. The Loons had one idea for getting the ball into the opposing net. Get the ball to Rodriguez. Have him lay it off, and hit a quick pass behind the lines for a runner. That’s a great club to have in your bag! If you can attack like that, it can really lead to some thrilling soccer. But you really can’t have that be the only thing. One thing that was a warning sign for me in Los Angeles was the lack of impact from either of Minnesota’s fullbacks, who are gifted attackers. The team needs to not only have the option to play the ball through the lines to a run, but there also must be the option to go over the top with long diagonal passes. That hadn’t really been there against the Galaxy, and this concern became a full-on flashing #PANIC light in New England. 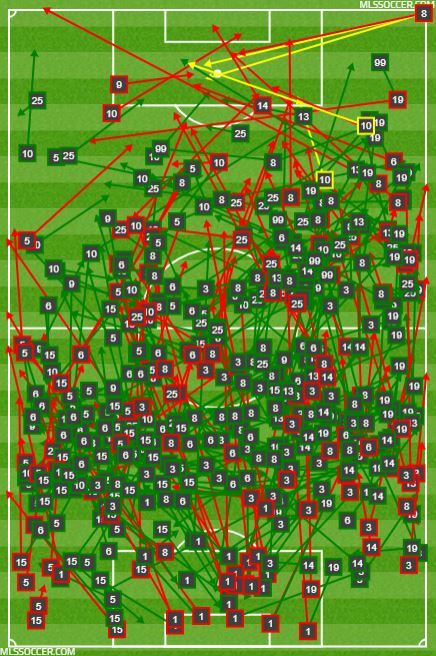 Take a look at the impact from Francisco Calvo and Romain Métanire against Vancouver (left) when I wondered the Loons had the best fullback tandem in the league. Compare it to the impact they had against New England, when I wondered if the best fullback tandem in the league was secretly Andrew Farrell and Edgar Castillo. The extent to which Minnesota’s fullbacks get involved in the attack, especially Calvo, is a good barometer of how the team is playing. After flying high in Vancouver, they have been pushed further and further back. Were they so afraid of DeJuan Jones and Brandon Bye (no offense to either, but they are not experienced internationals) that they needed to play so conservatively? When you have fullbacks like the Loons have, they need to play high. It’s all but mandatory. Minnesota must attempt to dictate the place where the play happens on the wings, or die trying. That means Calvo and Métanire need to press forward, regardless of who is behind them. It is unacceptable to stay cautious and pinned back all game. Let the likes of Ike Opara and Michael Boxall handle balls into the box from wide areas. Be an outlet. Try to pin the other team’s wide players back. Anything but passivity. Over the course of a season, United should trust that being more aggressive on the wings will result in scoring more goals than it will result in allowing. 2. The Loons will have a chance for redemption immediately. When the schedule was announced, most fans surely chalked next week’s game against the Red Bulls up as a loss. But through four games, New York have just one win, one draw, and two losses. They lost at home to Orlando (!!) during the international break and away to Chicago (!!!) this past weekend. This is a beatable team. Minnesota could certainly erase some of the frustration from the loss in New England by putting up a strong performance on the shores of the Passaic next weekend. 1. Miscellaneous Notes. The USL League One season has started, but Forward Madison had a bye for week one. They scrimmaged against Marquette University instead. Mason Toye, Wyatt Omsberg, Carter Manley, and Dayne St. Clair all got minutes. Toye scored in the 4-1 win. While we know already that those four players are better than college-level, it certainly beats sitting at home for their development. Even against lackluster opposition, playing in a professional environment under a seasoned, professional coach like Darryl Shore, has got to be a plus… …My prediction that San Jose will be historically bad this year is looking good. The Quakes lost 0-5 to Los Angeles, and their supporters section was a fraction of the traveling support. Y-I-K-E-S… …Atlanta United lost again, which is becoming very funny. If Orlando fans were smart, they’d be creating a bunch of sockpuppet Atlanta Twitter accounts to advocate for Frank de Boer getting more time… …Glad to see Ethan Finlay make his first start since tearing his ACL. Was a tough game for him, however, as he struggled along with the rest of Minnesota’s wide players… …The Twins might have good pitching, so there’s that.